Enjoy the beauty of the Coast while perfecting your game at Pender Harbour Golf Club, five kilometers north of the community of Madeira Park. This 9-hole course was built with a unique combination of flat and hilly fairways with challenging water hazards scattered throughout, with elevated greens allowing for views of the water and surrounding mountains. Pender Harbour Golf Club has long been a well-kept secret, offering amenities such as a driving range, practice green and a clubhouse with dining facilities, licensed premises, a lounge, outdoor patio & BBQ facilities. Try out the Public Course, visit the pro shop and be sure to make your Tee Time Reservations and rent either a pull car or power cart. The Sunshine Coast has excellent biking with many different degrees of difficulty to suit everyone's level of skill. Choose your style - safe road cycling routes along Highway 101 from Saltery Bay to Powell River or the 139km stretch from Langdale to Lund, or a multitude of ocean view mountain biking trails for expert riders or exploring the wilderness with the family. Some of the most popular trails around are Bunster Hills Loop, Mud Lake Trail System, Suicide Creek Loop, Elephant Lake Loop and Texada Island. Enjoy the peace, fresh air and wildlife sightings while hiking on rocky shorelines or through woodland trails. 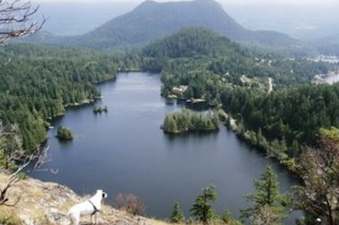 Gorgeous viewpoints overlooking Pender Harbour can be found via two trails,Mount Daniel (1,375 feet/419 m) sits above Garden Bay and takes approximately 90 minutes to reach the top (5 miles/8 km return). The Pender Hill Trail (758 feet/231 m) rises sharply from the saltchuk (a Native term for water) above Irvine's Landing and will take approximately 30 minutes (2 miles/3 km return). Another popular hiking trail near Pender Harbour is the Sunshine Coast Trail, which stretches 180 km from the Saltery Bay ferry terminal in the south to Sarah Point in the world-famous Desolation Sound Marine Park in the north. There are many access points around Powell River with varying terrain, appealing to all ages and athletic abilities. Pender Harbour is a fisherman's paradise, offering some of the finest sport fishing in the world along its shoreline and in its many lakes and streams. The Sunshine Coast offers year-round guided fishing for Chinook salmon, with feeder Chinooks present during the winter months, and the migratory Chinook showing up in late spring. The best fishing is from June to September. Be sure to visit one of the marinas for helpful fishing tips, and to stock up on charts, maps, fishing licenses and most importantly- learn the restrictions and limits. A true West Coast kayaking adventure, Pender Harbour is dotted with waterways, coves and inlets, perfect paddling locations for kayakers of all skill levels. Spend the day paddling on a calm lake and take in a gorgeous sunset, or take on the exciting challenge of raging tidal rapids. With accessibility to 32 lakes, Powell River (located north of Pender Harbour) offers unparalleled freshwater kayaking opportunities at Lois Lake, Elephant Lakes, Rainy Day Lake, Smuggler Cove, Duck Lake, and Sliammon Lake just to name a few! A visit to the Sunshine Coast wouldn't be complete without some time spent in the water, either indoors or on the waterfront. The Pender Harbour Aquatic & Fitness Centre offers a 20 meter four lane pool, hot tub facilities, sauna, weight room and a workout area. For those who prefer the outdoors, most waterfront parks offer saltwater access. A favourite of the area is Baker's Beach. Hidden in a small bay, the waters are calm, good for swimming, tubing and snorkeling. Freshwater Swimming can be found at Ruby Lake. This is a popular beach perfect for a day excursion. Another favourite is Katherine Lake Regional Park, which offers a family-friendly sandy beach with shallow shore. Garden Bay Lakealso offers a sandy beach & small dock. Other swimming spots can be found atHotel Lake, Mixal Lake and Sakinaw Lake. The Pender Hill Trail is perfect for exploring and enjoying the scenery, as many beautiful places in the area can only be reached by hiking. The Pender Hill Trail is 1 km in length with a challenging steep trail, but the end result is one of the best views of Pender Harbour and the Sechelt Peninsula. Access to Pender Hill Trail: Follow Hwy 101 north from Pender Harbour approximately 5km (3.4 mi.) north of Madeira Park and turn west off Highway 101 onto Garden Bay Road. Approximately 4.5 km further, turn right onto Irvine’s Landing Road, then right again approximately 3.5km further onto Lee Road and follow signs. 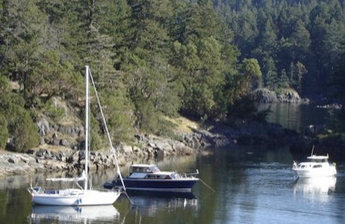 Smuggler Cove, located 16km West of Sechelt, is a popular destination for many Sunshine Coast residents and tourists. A sheltered 182-hectare marine park that surrounds Smuggler Cove can be accessed by boat at the north end of Welcome Passage or by land via a 4km hike from a parking lot at the end of Brooks Road, off Highway 101. This park provides five campsites with toilets, and there is good swimming and picnic areas for visitors. The park offers a wide variety of nature trails allow for peaceful walks, back country camping, scuba diving, canoeing and kayaking in sheltered coves. The park is home for many beavers, birds, wildlife and plants and also offers gorgeous views of Georgia Strait and Welcome Passage. Skookumchuck means "strong water" in Chinook Jargon, an intra-indigenous language, but the rapids are exciting in any language. In a three-metre tide change, 200 billion gallons of water flows through the Skookumchuck, which connects Sechelt Inlet to Jervis Inlet. 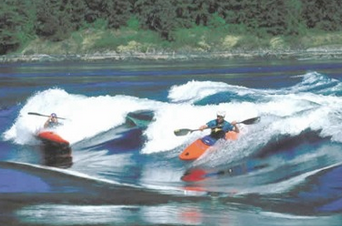 The Skookumchuck rapids can reach speeds of 20 MPH or 18-20 Knots. To view the most spectacular rapids, you want to time your hike so you arrive at the viewpoint when the tidal surge is at its strongest. Make sure you dress appropriately, as the hike is through a rain forest, which can be cooler and damp even in the summer. Take in the over 200 year old Indian Rock paintings and watch seals and bald eagles along the channel in The Skookumchuck Narrows Provincial Park. 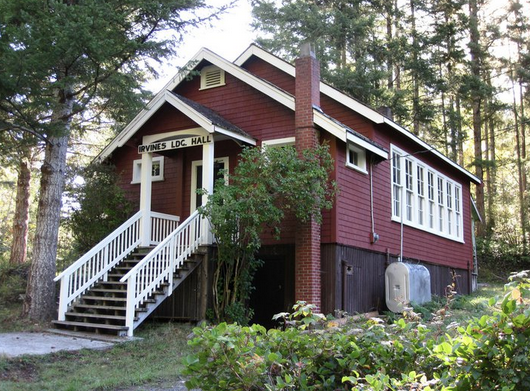 Pender Harbour Landing $40,000 donation to secure a 20-year lease on one of the oldest schools in Pender Harbour, the 77 year old Irvine's Landing School, ensured its transformation into a vibrant community centre. Pender Harbour Landing also offered a link to their nearby services which saved the community considerable land and expenses when restoring the historical property. The developers of Pender Harbour Landing renamed the historical building "Sarah Wray Heritage Hall" in honour of the first non-native woman to live in Pender Harbour.